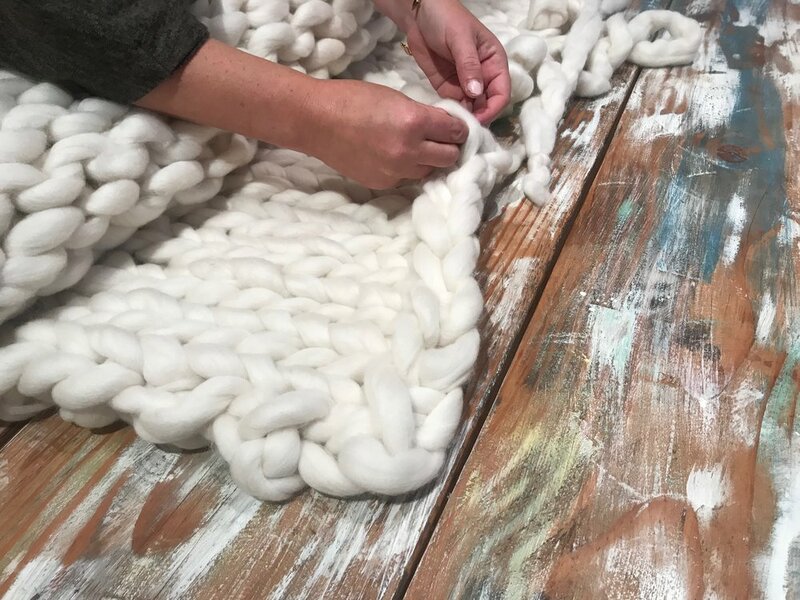 Learn how to make a dreamy, super thick and cozy knit blanket out of wool roving, plus tips and techniques for caring for these blankets. No knitting experience required! a “table knitting” technique, where you will form the stitches with your hands rather than using knitting needles. Nota bene: Students can choose from 8 colors. Cara must have everyone's color choices 10 days before the workshop so she can order the wool. If there are still open spots after that deadline, she can order some extra undyed wool and students will have to take that color. Cara Corey is a knit and crochet pattern designer and owner of Cara Corey Designs. She specializes in simple, modern designs using oversized yarns and unorthodox materials. You can find her handmade home goods and cool-weather accessories at stores in San Francisco and Sausalito.